Check out The Ultimate Guide to Square Taper Bottom Brackets by First Components. This article is the absolute best on the internet when it comes to the subject of square taper bottom brackets. You will get all the information that you need, whether you are looking to buy a new bottom bracket or just looking to do some maintenance on your existing unit. What’s really interesting is that the article shows a press fit version of the square taper BB. It’s probably a unique product, one produced by First Components. The idea is that if you have wrecked the threads in the BB shell, and can no longer install a threaded BB into it, you can still use your existing square taper cranks. Sure, you may like to upgrade to a press fit solution (BB30, PF30, BB86 etc.) and enjoy the benefits of an integrated crank. But you can also stick with the square taper cranks that you currently have. The post goes into great detail about the tools you will need and how to use them as well. Specialist tools are good to have, but not necessary. For example, a torque wrench will be really handy, not least because you can get the bottom bracket tightened within the required tolerances. Nevertheless, you can still get it tight enough using simply an existing allen wrench. 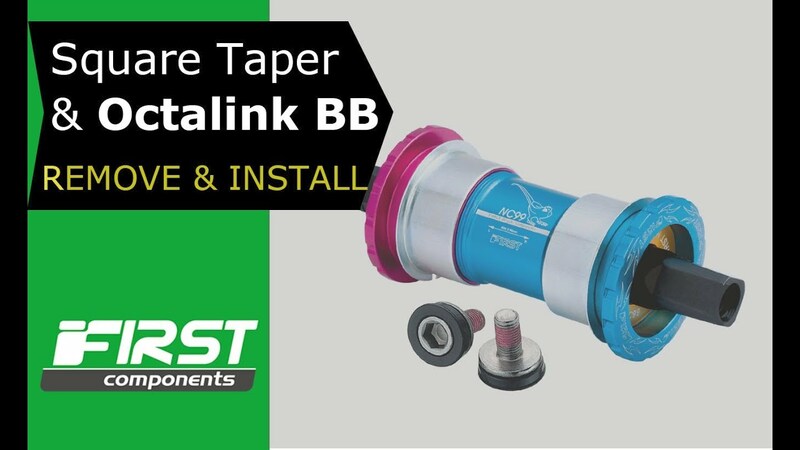 There’s a complete video on Removing and Installing a square taper bottom bracket that shows you the complete sequence required to either remove your bottom bracket from the BB shell, or install it back in . . . or install a new one if that’s what you need to do.